With high-end phones increasing in price every year, it seems almost inevitable that we’ll see far more OEMs attempt to crack the bubbling sub-flagship market. Samsung, Motorola, and more recently Nokia, have all tried to tempt consumers with devices that offer near-flagship-level specs on a modest budget, but it’s Honor — Huawei’s youth-focused sub-brand — that has repeatedly made the “affordable flagship” arena its own. Fresh off the recent launch of its elite offering for 2018, the Honor View 10, Honor is back with a successor to the Honor 9. Priced at 399 pounds/euro in Europe, can the Honor 10 live up to its heritage — and increasing competition — to deliver a premium experience at a mid-range price point? Find out below in our Honor 10 review. The Honor 10 sports the same dual-glass panel with a metal frame design we’ve seen from the Chinese firm’s N-series devices ever since the Honor 8. This is a huge plus as the latest phone once again belies its actual price tag with a look and feel that could quite happily go toe-to-toe with the industry’s biggest hitters. There are a few design tweaks this year, though, including one potentially controversial change which we’ll address in the display section below (not-ch to make any assumptions, but you probably already know what I’m talking about). The most striking change is the new Phantom Blue and Phantom Green colorways and the 3D glass design. If you thought Honor’s previous experiments with light-refracting glass produced impressive results, you’ll be absolutely blown away by the Honor 10’s shimmering rear panel. Constructed from 15 different layers of glass with a nano-scale optical coating, the resulting visual effect can be absolutely mesmerizing. The Phantom Blue version pictured for this review shifts between different shades of blue and purple from different angles, while the Phantom Green has been designed to evoke the blue and green hues of the aurora borealis. If the more jazzy colorways aren’t to your liking, there are also Midnight Black and Glacier Grey variants available in select markets. You’ll be absolutely blown away by the Honor 10’s shimmering rear panel. Unfortunately, that ultra-smooth rear panel comes with a couple of downsides. For starters, the Honor 10 is possibly the most slippery phone I’ve ever used. Not only is it a wriggly customer in the hand when you’re not tightly gripping the frame, I’ve also caught the device very gradually sliding its way off all manner of seemingly flat surfaces. The glass is also prone to fingerprints and other unwelcome smudges, although it’s far from the worst offender in this regard. Sticking with the rear of the phone, some may be a little put off by the protruding dual-camera module, although the horizontal orientation is a welcome change from the current crop of me-too iPhone X copycats rocking vertical shooters. Meanwhile, the adjacent AI Camera branding is subtle enough to ignore, but it’s still a little superfluous. On the right side, we have a physical volume rocker and power key, with the former doubling up as a shutter button, while the left is home to a solitary dual-SIM tray. Unlike previous models, there’s no option to use a microSD card in one of the slots, so you’re stuck with just the built-in storage. Aside from the USB Type-C port, a top-mounted IR blaster and Honor’s continued support for the 3.5mm headphone jack, the only other notable design feature is the fingerprint sensor. In a smart bit of design, the front-facing sensor is now under the glass, with the usual indent replaced with a minimalist oval outline on the flat bottom bezel. Honor says the new design means you’ll be able to use the reader when it’s wet — which is absolutely true — but it’s worth noting that the Honor 10 hasn’t been IP certified for water or dust resistance. The Honor 10 features a Full HD+ 5.84-inch display with a 2,280 x 1,080 resolution and a 19:9 aspect ratio. That translates to a respectable 432 pixels per inch. The extra surface area comes from, you guessed it, that notch. The wider Android Authority family and you, our lovely readers, have all aired varied opinions on the controversial cutouts, but the reality is that you won’t know for sure if it’s a genuine problem until you’ve used a notched phone for a little while. 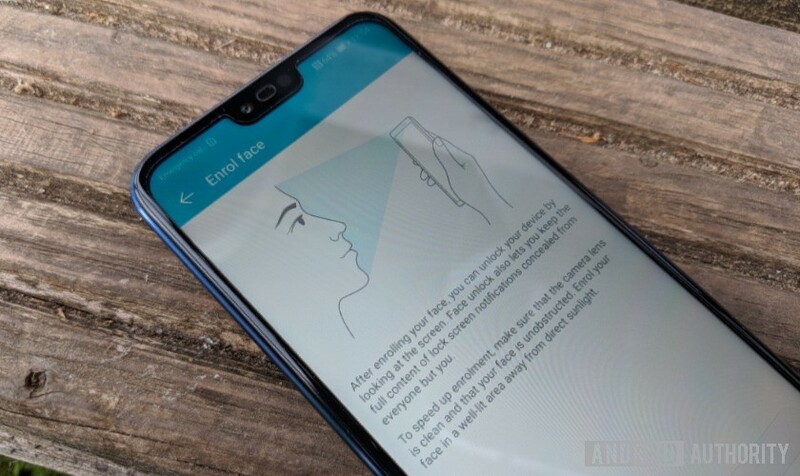 For what it’s worth, I forgot about the Honor 10’s notch within a few hours and was happy to find that Honor has followed Huawei’s lead by including a notch on-off toggle. As for the display quality, it’s very much on par with the usual 1080p panels found on the majority of mid-range phones. Colors are crisp, viewing angles are fairly consistent, and it’s bright enough for use even in direct sunlight. Out-of-the-box, the Honor 10 defaults to Vivid mode which oversaturates colors for an added visual punch. This can be switched to a far cooler Normal mode in the Settings menu. There’s also a temperature dial for more granular tweaks, an eye comfort mode for filtering out blue light, which can be scheduled for a certain time of day, and an optional smart resolution toggle that automatically drops the display resolution down to a 1,520 x 720 resolution to conserve battery when required. While the Honor 10’s LCD panel won’t ever deliver the kind of deep blacks or popping colors of a top-end OLED display, there are no glaringly obvious compromises compared to other far more expensive devices. The only exception to that rule is the possible lack of toughened glass — we’ve reached out to Honor to clarify the situation, but it seems as though the Honor 10’s front panel may be as fragile as its V-series counterpart. That aside, at this price point, it’d be a struggle to find any phone that can match the Honor 10 in the display stakes — notch and all. The Honor 10 is kitted out with the same HiSilicon Kirin 970 SoC that powered the View 10, as well as the Huawei Mate 10 Pro and P20 series. We’ve waxed lyrical about Huawei’s current flagship processor for months now, and for good reason. The SoC has a proven track record of delivering smooth, reliable performance, and enabling advanced AI features thanks to the Neural Processing Unit (NPU). The fact that the Honor 10 is now the cheapest device on the market to boast a chipset of such a high caliber is a huge boon for the device on paper, and it didn’t fail to live up to that promise during real-world tests. Be it HD gaming, high-quality audio streaming, or intensive multi-tasking, the Honor 10 didn’t stop to catch it’s breath once. That’s due in part to the 4GB of RAM, which is standard for the European model, and the Mali-G72 MP12 GPU. The Honor 10 comes with 64GB or 128GB of storage, depending on region (Chian gets a version with 6GB of RAM). 128GB of onboard storage is double the total found on the Honor 9, but there’s no expandable storage this time around. On the plus side, both SIM slots now support 2G, 3G, and 4G networks across GSM, HSPA, and LTE bands. While Honor’s decision to position the fingerprint sensor on the front may irk some potential buyers, even if it is all-but-invisible under the glass, I’m happy to report that it’s as lightning fast as any other Honor or Huawei reader. In addition to one-touch tap to wake support, it also doubles up as a handy capacitive home button. On the audio side, traditionalists will no doubt be happy that Honor has retained the 3.5mm jack on the bottom edge for wired headphones. Huawei Histen also returns with optional 3D audio profiles and a plethora of EQ settings. Shifting over to the right side, the Honor 10 features a single speaker tucked alongside the USB Type-C port. The mono speaker setup pales in comparison to devices that offer stereo speakers, but it does deliver a relatively clear and rich audio experience as long as it isn’t cranked up to the max. Looking at endurance, the Honor 10 houses a non-removable 3,400mAh battery, which is slightly larger than the Honor 9 (3,200mAh) and a tad smaller than the View 10 (3,750mAh). There’s also support for two power saving modes and fast charging, with the latter refilling 50 percent of charge in roughly 30 minutes. For general use, the Honor 10 managed to get through the day with juice to spare. When put under pressure with the occasional Monument Valley 2 puzzle and a few Overwatch League streams on Twitch (over Wi-Fi), the Honor 10 mustered just over five hours of screen-on time. That dropped to between three to four hours when streaming over a 4G network and playing online 3D games like Paladins Strike. The Honor 10 runs Android 8.1 Oreo out of the box, with EMUI 8.1 on top. For some buyers, myself included, the custom UI has historically been something of a dealbreaker. Be it excessive bloatware, app redundancy, or its tendency to drift towards an aggressively kitsch design language, there’s always been something that immediately pushed me towards whatever custom launcher I could find on the Play Store. Love it or hate it, there’s no denying that EMUI is an increasingly versatile, feature-packed skin that gets progressively better and more customizable every year. Love it or hate it, though, there’s no denying that Huawei has created an increasingly versatile, feature-packed UI that gets progressively better and more customizable every year. In its latest guise, there’s almost no visual element you can’t tweak to some extent. That includes the notch, which can be masked with a black bar with a quick trip to the Settings — although it’s a shame there’s no quick toggle in the notifications bar. There are almost too many control options to take in and remember, so much so that I got a little confused after enabling as many as I could at once. Give it a few hours, though, and you’ll be taking screenshots using knuckle gestures, muting notifications by flipping the phone over, and will have settled on a navigation bar layout that suits your personal style. If I have one niggling complaint here, it’s that the notch and app drawer toggles, gesture controls, and navigation button options are scattered all over the place. Some are filed under Display, some under Smart Assistance, while others are stored in the main System menu. This isn’t solely an Honor/Huawei issue, of course, and Android P’s renewed focus on gestures and native notch support should help in the long run — that is if Honor can improve on its historically hit-and-miss update schedules. One thing that can’t be called hit-and-miss is Face Unlock, which has become a staple of Honor phones from the View 10 all the way down to entry-level devices like the Honor 7A. I don’t have a whole lot to say about it other than it works exactly as it’s supposed to by unlocking the phone with a quick glance. Honor has championed dual-lens camera tech for several years now, so it’s no surprise to see two sensors on its latest offering. The Honor 10 sports a primary 16MP f/1.8 RGB lens and a 24MP f/1.8 monochrome sensor for taking detailed black and white shots and providing additional sharpness and detail to color images. The biggest change this year is the AI Camera functionality. We’ve already seen plenty of AI photography features on Honor/Huawei phones, with the Honor P20/P20 Pro’s scene recognition features a recent highlight. To switch the AI Camera features on, all you have to do is tap the AI button in the camera app. When activated, the Honor 10 will automatically tweak the camera settings to best capture the subject in real-time based on data for over 500 scenarios across 22 categories. Unfortunately, the Honor 10 doesn’t quite deliver the same kind of versatility as its more expensive siblings like the P20 or Mate 10 Pro, as you don’t have any control over the scene recognition process. In fact, the user’s only choice comes down to whether to turn the AI Camera features on or off. You can judge for yourself whether the AI Camera does a better job than the regular auto mode in the comparison photos below. On the whole, I found that even though the AI Camera takes away a lot of control from the end user, it does generally produce better images with far richer colors and a greater dynamic range. That’s especially true for shots with multiple subjects as the camera can analyze multiple scenes — like rivers, trees, and skylines — at once. If you prefer a little more control over the camera (and a bit of fun), the Honor 10 has you covered too. As well as a detailed Pro mode and a dedicated monochrome mode, there are also options for taking 3D panoramas, a document scanner, time-lapse and light painting modes, and an Artist mode which lets you apply a bunch of quirky Prisma-like filters to your snaps. Bokeh fans will also be glad to hear that the Honor 10 camera features a dedicated Wide Aperture mode where you can change the aperture level using a slider. You can also get the phone to do the work for you via the Portrait mode. This works with both the rear shooter and the front-facing selfie camera which clocks in at a whopping 24MP. The front-facing selfie camera clocks in at a whopping 24MP. Portrait shots can look a little artificial, especially when the blur encroaches over from the background and into the foreground, but the results are decent considering the camera hardware limitations. The aggressive beautification settings don’t help matters either. I’m sure there are plenty of people out there that want to turn their faces into creepy, featureless husks with anime eyes, but I’m not one of them. One major omission is the lack of optical image stabilization. You won’t notice when taking photos during the day, but try to take a snap in low-light conditions and you’ll start to see why it’s still such a sought-after feature for flagship camera phones. The results aren’t terrible by any means, but noise and blur will start to creep in when taking photos at night. This also affects video capture — especially at 4K quality — although it seems as though there’s some kind of AI assistance going on in the background to reduce screen shake. In addition to a host of new smart gallery features, the Honor 10 has one final trick up its sleeve: AI Shopping. Tap the eye icon and the camera app will transform into a visual shopping app that can theoretically analyze any product in the viewfinder and take you directly to a link where you can buy it online. I say theoretically because the mode barely ever worked for me. The first issue is that the feature is based on Amazon Assistant, so unless the item you want is for sale on Amazon, you’re fresh out of luck. The other major problem is that I couldn’t ever get it to actually find any of the products I scanned, including those that I know for a fact are readily available on Amazon over here in the U.K. While I’m sure the feature will improve over time, at the time of review the Google Lens-like mode is barely functional, with only barcode and QR code scanning options producing accurate results. Sometimes. In the end, though, these downsides are heavily outweighed by how impressive the overall experience is for a phone that retails for less than 400 euros (399 euro and 399 pounds in the UK). There were times that I was subconsciously comparing the Honor 10 to phones that sell for at least 200-300 euros over the Honor 10’s asking price, and it still felt like a genuine rival in certain areas — particularly the overall hardware performance, the generally impressive dual-camera, and the stunning design. If you have a little extra cash to spend, you might want to opt for the Honor View 10 which offers many of the same features you’ll get with the Honor 10 but with a larger screen, expandable storage, and a marginally larger battery. There’s also the OnePlus 6 or even OnePlus 5T to consider if you can stretch your budget even further. Regardless of your choice, there’s no doubting that the Huawei sub-brand has once again delivered an outstanding level of quality at an enticingly low price with the Honor 10. Previous articleHonor 10 specs: The Huawei P20 in Honor clothing?